The CareServant Patient Engagment Portal lets inpatient and ambulatory patients become more involved, better educated and more connected during their hospital stay. To make this happen, several building blocks have to be carefully put together, customised to fit into each hospital’s very specific environment. The below sections describes these important building blocks that will be aligned with hospital’s key stakeholders to customise the solution. The applications within the CareServant portal can improve every aspect of the patient experience during the hospital stay. Plus, hospital processes – many of which are often still manual and involve heavy staff intervention – can become more efficient. We work flexibly with every customer and introduce applications according to their needs and priorities. After that, through our open architecture we can easily add new functionalities in a modular way. 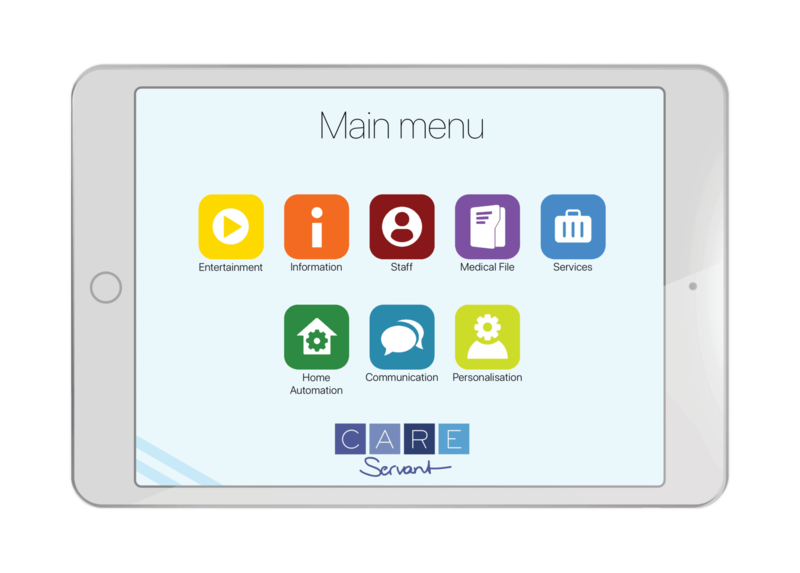 CareServant’s management system includes a powerful Content Management System and – via the HL7 connection to the HIS – exchanges patient information to create truly personalised patient experiences. The (optional) direct connection of the CareServant system with HL7 makes it possible to automatically manage patients and personalize the content. This link uses the HL7 ADT messages and is fully in accordance with the privacy laws also when using BYOD. The CareServant CMS allows for a completely flexible set up of the system, in terms of design, logos, applications, content and content structure. Hospitals can create numerous user groups, based on age, gender, language, medical aid plan, status (Regular or VIP), location or type of device (Central or BYOD). Patients can be part of several user groups. Based on user groups, hospitals can differentiate experiences in many ways: Designs (e.g.larger icons for elderly patients), Content (e.g. specific Maternity Ward videos) or services (e.g. VOD only for VIPs). Also, patients can individually download pre-selected apps from a private app store. CareServant integrates with hospital systems and 3rd party software to create a comprehensive, single sign-on portal covering a variety of applications. Its management system is flexible to adapt to different use cases. These include Meal Ordering software, Telecommuncation & Nurse calling systems, Home Automation systems, Electronic Medical Records and many more. CareServant’s open architecture makes these integrations easy to do. CareServant’s software is device-agnostic, functions on all operating systems and is flexible in many other ways. For example, a hospital can use different devices (Apple TV and iPads) or different use cases (e.g. fixed vs. rental) – all concurrently within one system. CareServant can serve hospitals who want their patients to use their own devices to securely access hospital applications. Our iOS application can be downloaded from the Apple Store for iOS devices (iPads and iPhones), and we can create hospital-specific Android apps. CareServant’s business model is focused on patient experience during the hospital stay. However, in the BYOD mode hospitals can offer additional use cases for pre- and post hospital stay, such as pre-admission preferences or post-hospital treatment plans. 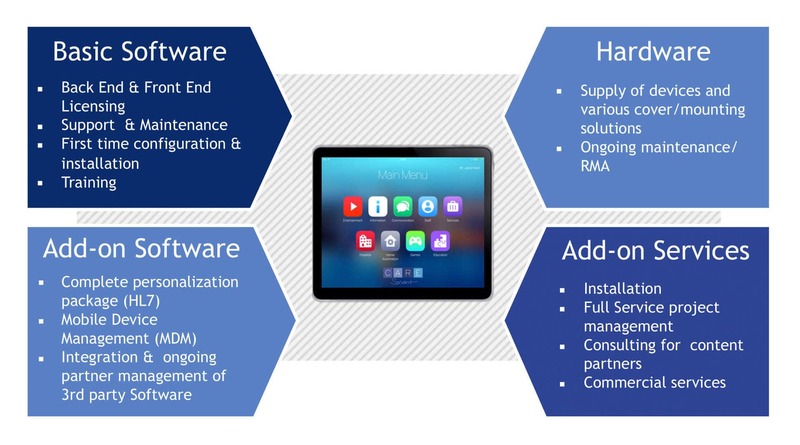 We prefer Apple as a platform to manage the complexity of a distributed hospital system. The Apple ecosystem – consisting of patient and staff hardware, infrastructure and services – offers us an optimal, tightly managed platform with minimal effort in IT management, especially compared to Windows based solutions. Apple is the ideal partner for B2B2C patient bedside solutions, now and – because of its strategic focus on Healthcare – also for the future. It is more secure, easier to set up and easier to manage on an ongoing basis. As a Jamf Pro Managed Service Provider (MSP), CareServant is also fully integrated with the leading Apple Mobile Device Mangement software. We use Apple’s Device Enrolment program (DEP), Apple’s Volume Purchase Program (VPP) and Jamf Pro to easily set up and maintain client devices. CareServant’s HL7 software manages the Admit/Transfer/Discharge process. Processes are managed automatically via the server-side, which reduces the work for IT and Care staff to a minimum. Within the hospital IT network, central & patient-owned devices can access to all applications in a secure way and respecting privacy legislation. All applications are automatically removed once patients get discharged, without the need for any staff intervention. CareServant’s business model is based on long-term relationships in a Software-as-a-Service (SaaS) model. Base functionalities start below R160/bed/month. Licenses for additional functionalities are added in a modular way. Minimal up front fees for set up and integrations depend on the project scope. We also offer full project management, hardware, installation and repair, usually with the support of trusted partners or resellers. We find often the best start for a co-operation to be a Pilot/PoC or a more basic version, based on which we can learn and expand together.